1882 - Jan. 17 exiled to India with his father and a family group of 150 members. 1884 - June. Ghulam Muhammad and Mahmud Tarzi's tour of India start. 1885 - Ghulam Muhammad visits to Sultan Abdulhamid in Istanbul. 1886 - June. Another visit to Sultan Abdulhamid with Mahmud Tarzi. 1891 - Married to Asma Rasmiya, daughter of Sheikh Saleh Al-Mossadiah, businessman and the muezzin of Amawia mosque. 1896 - Mahmud Tarzi depart from Damascus to Istanbul for participating of Sayyed Jemaleddin's meetings. 1897 - Ghulam Muhammad's last pilgrimage to Mecca. 1900 - 15 Shawal, 1318. Dead of Ghulam Muhammad Khan. 1901 - Journey to Istanbul following his father's dead. 1902 - Feb. Amir Habibullah invites Mahmud Tarzi and his family back to Afghanistan. Appointed chief of bureau of translation for Royal Court (dar-ut-tarjama), by Amir Habibullah. 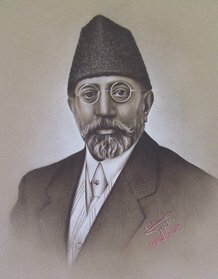 1902 - March, Mahmut Tarzi and his nephew Habibullah travelled to Bambay, Delhi, Lahore and Peshawar. 1904 - Habibiya College for Boys was established. 1904 - Royal Military College was establised. 1904 - Oct. 7 back to Damascus with his nephew Habibullah. 1906 ~ 1911 - Constitutional movements in China, Ottoman Empire, Persia. 1910 - 15 Sevval 1329 Kameri. First issue of Seraj-ul Akhbar. 1913 - Foundation of Afghan Department of Education. 1914 - Founding of a teacher-training center (Dar-ul-Muallemin and Dar-ul Ta'alif). 1919 ~ 1922 - Minister of Foreign Affairs. 1919 - May, Third Anglo-Afghan war began. 1919 - Aug. 19, Decleration of Afghanistan Independency. 1921 - January until November, Negotiation with Britain in Kabul. 1922 ~ 1924 - Afghan Ambassador in Paris, France. 1924 ~ 1927 - Minister of Foreign Affairs. 1927 - Jan. Left Kabul for medical treatment in Europe. 1928 - Official meeting in Egypt as a minister of F.A. 1929 - Exiled to Istanbul with his family. 1933 - Nov. 23, His dead in Istanbul. 2005 - Sept.01, Mahmud Tarzi Cultural Foundation (MTCF) is established in Kabul. 2008 - nov.22/qaus 2- 1387; koran prayed and held a conference at his house, at Darrul Aman Mahmud Tarzi Lycee. On 23rd a academic conference held in Higher Edu Ministry halls for his 75th memorial anniversary. 2009 - June 8th-9th. MTCF organized an International Forum in memory of Allama Mahmud Tarzi together with Unv.of Istanbul Faculty of Literature and Institute of Eurasia in Eurasia Institute halls,Istanbul with unselfish support of Turkish State and gov. 2014 - September. "iki kral,bir lider"(two kings and a leader), a book about his life,written by Omer Tarzi, published. 2018 - Nov. 23. Family gathered for 85th years of his death in Istanbul.